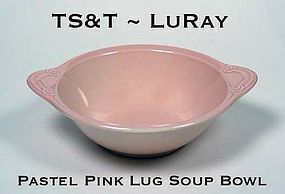 This LuRay pastel pink lug soup was made in the 1940's by TS&T, and is in excellent condition! Estate fresh and beautiful! It is code dated 6-40. There are 5 pink bowls available for $20.00 each.